When you need to communicate with someone who does not speak the same language as you, it is likely that you will need interpreting services. As our second core business is interpreting, we specialise in providing interpreting services that allow easy communication, wherever and whenever you need it. Just provide us with your requirements and we will provide you with the right interpreter, who will deliver to your needs and wishes. Interpreting while the speaker is speaking. The interpreter works in a booth with at least one colleague. The speaker in the meeting room speaks into a microphone; the interpreter receives the sound through a headset and renders the message into a microphone almost simultaneously. The participant in the meeting room selects the relevant channel to hear the interpretation in the language of his/her choice. Simultaneous interpreting is most frequently used for large conferences or meetings. 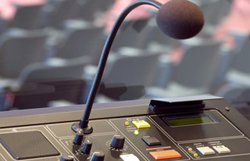 This interpreting generally requires equipment such as microphones, headsets, and soundproofed booths. Interpreting after the speaker has finished. Also called "Face to Face" interpreting, this mode is commonly used for business meetings, negotiations, technical seminars, commissions/boards, training workshops etc. The interpreter sits with the participants, listens to the speech and renders it in a different language, generally with the aid of notes. Our interpreters will be your ears and mouth and will help you to communicate your message effortlessly. Your needs are our priority, which is why our interpreters always carefully prepare themselves, based on the materials supplied, so that their performance is impeccable. (chuchotage, in French), the interpreter sits or stands next to the small target-language audience whilst whispering a simultaneous interpretation of the matter; this method requires no equipment, but may be done via a microphone and headphones if the participants prefer. Whispered interpretation can be used only for very few participants (ideally not more than three) sitting or standing close together. It is used mainly in bilateral meetings or in groups where only a few participants do not share a common language. Interpreting between two languages via a third. A source-language interpreter interprets the speech to a language common to every interpreter, who then renders the message to his or her respective target languages. This solution is most often used in the multilingual meetings of the EU institutions. This mode of interpreting involves relaying what is spoken to one, between two, or among many people. This can be done after a short speech, or consecutively, sentence-by-sentence, or as chuchotage (whispering); aside from notes taken at the time, no equipment is used. Liaison interpreting is usually used as a link between two people or small groups of people who speak different languages. To avoid chaos, we recommend this mode of interpreting for not more than four or five people in total. One of the main fields of liaison interpreting is that of businesses. The interpreter needs to know both languages very well and translates what everyone says. Although in general, with liaison interpreting, the interpreter doesn´t need to do the same kind of preparation as with simultaneous or consecutive interpreting, it is still important that the client to provide c ertain material for the interpreter beforehand. Interpreting services can be delivered in multiple modalities. The most common modality through which interpreting services are provided is on-site interpreting, and video and telephone interpreting.